Helen Bulovsky always wanted to care for others. When war came, she was determined to do her part. Despite a chronic heart condition that all but ensured an early death, she joined the Army Nurse Corps at the age of 22. 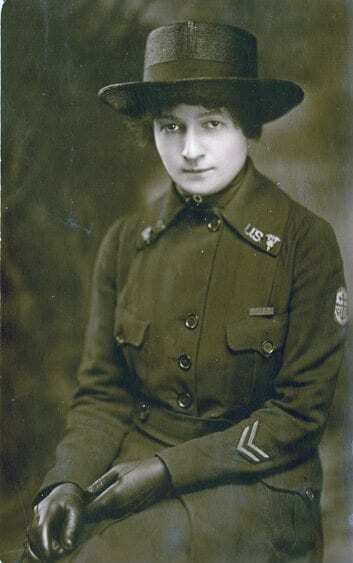 First serving in France at a Base Hospital staffed with nurses from Milwaukee, Helen was later sent to an Evacuation Hospital just behind the front lines. Helen did her best while serving those that needed her most. As the war continued, so did she, seemingly gaining strength from those that she served. The year after the war ended, Helen returned home and continued her nursing career. She died suddenly from heart disease in 1923, at the age of 27. Her career dedicated to saving others left a lasting impact well beyond her short life. To learn more about Helen’s story, visit the temporary exhibit WWI Beyond the Trenches: Stories from the Front at the Wisconsin Veterans Museum. This exhibit will be available to the public until January 2019.